The majority of kids (and adults) feel angry and frustrated sometimes. Anger is an emotion and it is ok to experience emotions. 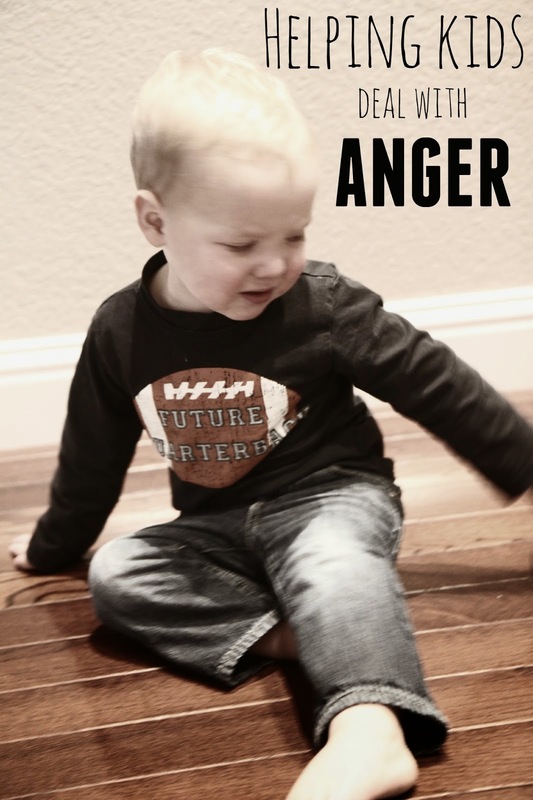 The problem sometimes is how kids act when they feel angry or frustrated. They may hurt someone, say mean things, throw something, etc. As parents we have the challenge to model how to handle anger appropriately and teach kids to do the same. I think the first step is to learn how to deal with our own anger or big emotions in appropriate ways. I have four kids (ages 8,5,3, and 7 months) and they are absolutely adorable and sweet but they can really make each other frustrated sometimes as they fight over toys or get angry when someone breaks something or doesn't follow the plan they had in their mind. Early on in parenting I would sometimes find myself telling my son to "stop crying" when he was upset and to "just calm down" when he was angry. Over time I have learned that there are better strategies I could be teaching my kids during situations when they are angry or frustrated instead of just encouraging them to stop it and bottle up the emotions. Big emotions can be scary for kids and when adults just get angry or frustrated at kids for having big emotions then it is really tough for any learning to happen... let alone any behavior to change. We have family meetings in our home and at a recent meeting we talked about strategies for managing anger and frustration. Some of the strategies were more advanced and better for my 8 and 5 year old and some were simpler and appropriate for my 3 year old. 1. Read a book about big emotions. When we talk about behavior and emotions sometimes it is helpful to read a story about someone who has big emotions. 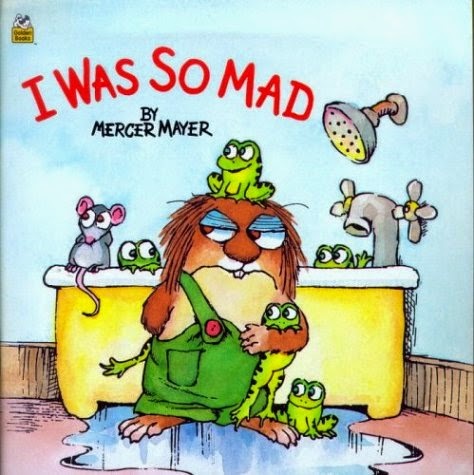 I love reading the the book I Was So Mad by Mercer Mayer with my kids. As we read through each part of the story we talk about how the Little Critter was feeling and a good choice he could've made instead of what he did. The only part of the story I don't like is when Little Critter talks about running away. When I read the book to my little kids I usually substitute different strategies into this part of the book, like some of the ones I will tell you about below. I love that the book helps show kids that their emotions are OK and then can be a good springboard for discussion and teaching. Do you have any other favorite books about big emotions? I'd love to collect a few more. 2. Make a visual to keep up in your house. I love this chart that we printed out from Childhood 101 that has a printable with 5 steps for managing big emotions. Having the chart visible for when kids have a meltdown can be helpful. You can also make your own photo chart with pictures of your child doing each of the 5 steps if they need more concrete visuals. Taking time to breathe is really important when kids get angry. One of the quickest ways for my 3-year-old to calm down is by me holding a pretend candle in front of him and telling him to "blow out the candle." Even when he is really mad he can pull himself together to blow out the candle. Sometimes kids are so overwhelmed by their angry emotions that they really appreciate someone helping them to get it back under control. Other breathing exercises can also help kids calm themselves down. Often once my kids have calmed down after a big emotional outburst we will try and think about why their sibling (or friend) may have done whatever it was that triggered their anger. This step is typically for my older preschoolers on up. The kids figure out that their little brother hit them because he wanted their toy (not to just be mean) or that he threw something at them because they weren't letting him play with them, etc. Recognizing the reason behind the anger makes it easier to try and fix the problem, communicate better, or re-teach behavior. One way to release anger is to tell someone how you feel! When my toddler or preschooler are angry I like to help label their emotions and remind them to say, "I'm mad!" or "you made me mad." Sometimes labeling the emotion and saying it out loud to the person who made you mad is an easy way to start repairing the problem. It is a relief to let that anger out instead of holding it all inside. This one can be hard sometimes, but often you need to walk away in order to avoid saying anything hurtful or doing something hurtful. If my oldest gets into a conflict with his other siblings I try and encourage him to take a breath and walk away before physically or verbally reacting. Doing kind things for others can make a huge impact and change your heart. It is hard to be mad at someone that you are serving. Performing small acts of kindness for someone that frustrates you can help you like them better. I encourage my kids to draw a picture/note or drop a treat off on a sibling's bed if they have been mad at each other. Helping make their bed or pick up toys in their room for them can help too! We love to build a kindness tree to help focus on the nice things that we can do for family and friends. Exercise and going outside makes you happier. In nature it is easy to notice the beauty around you and moving from one location to a new one can also help your attitude shift. When my kids are feeling grumpy, sending them outside to ride bikes or look for bugs always changes the mood and cheers everyone up. Sensory activities are great for helping kids relax and recenter themselves. My kids especially love sand, playdough, and water play. You can find my 18 favorite sensory activities here. When I am angry or frustrated sometimes the last thing I want to do is give anyone a hug and sometimes that is exactly what I need. When my kids get angry and I ask them if they need a hug I am often surprised that when they accept a hug their anger turns into tears and then their entire body relaxes and they are able to calm down. Once they are calm it is much easier to re-connect and turn the situation into a teachable moment. At bedtime we have special time to connect with each of our kids. As I lie next to my kids at bedtime and ask them about their day often their frustrations and emotion spill out. We are able to talk about the problems and brainstorm ways we could fix them or respond differently. Simple things like, "___ wouldn't let me play with his legos today" to "___ called me a name at school and made me embarrassed and mad." Having a set time each day to discuss any challenges has helped my kids open up and feel more comfortable coming to me and my husband with questions. By dealing with problems as they arise, we are able to help the kids learn to navigate frustrating situations. Lately I am just working on monitoring my own frustration levels since I am under slept and our little baby has been crying a lot! These strategies for the kids have been helping me as well! 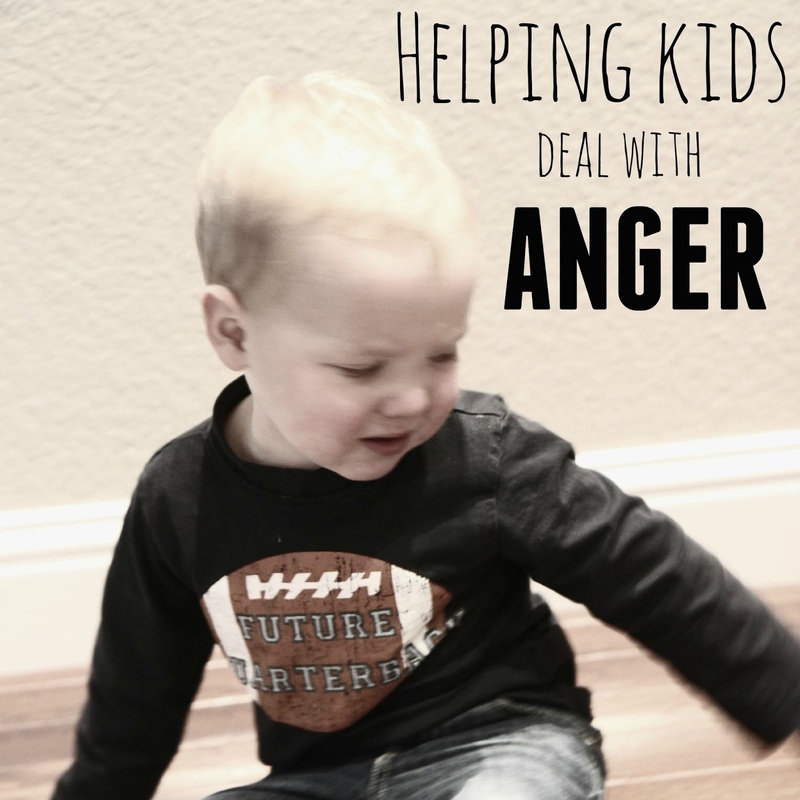 Do you have any strategies that you use with your kids to help them deal with anger and frustration? What sort of things trigger anger and frustration at your house? Some of these ideas from Lemon Lime Adventures for calming anxious children can also work for angry kids. Dr. Seuss's 'many colored days' is a great emotions book! It labels a color and gives a description to the emotions. It's one of my all time favorites. the book 'in my heart'. i can't remember the author. Have you read "The Way I Feel" by Janan Cain (great "colors" book, too) or "When Sophie Gets Angry" by Molly Bang? Sophie runs away...but I used to tell my kids she was just closing her eyes and pretending (kind of like daniel tiger?) and was really just sitting and taking deep breaths.